Gophers and ground squirrels are small, four-legged creatures that resemble rats or rodents and seem quite similar to each other. On close inspection, it is possible to differentiate between the two. Moreover, they are also different in terms of their habitats, diet, morphology and so on. We will describe each in detail in this article and then shed light on some common differences between the two. Gophers, which are also referred to as pocket gophers, are rodents that belong to the family of Geomyidae. About 35 species of gophers are currently living in the Northern and Central parts of America. Rather it can be said that they are endemic to North and Central America. A unique characteristic of these gophers is their extensive tunnelling activity. 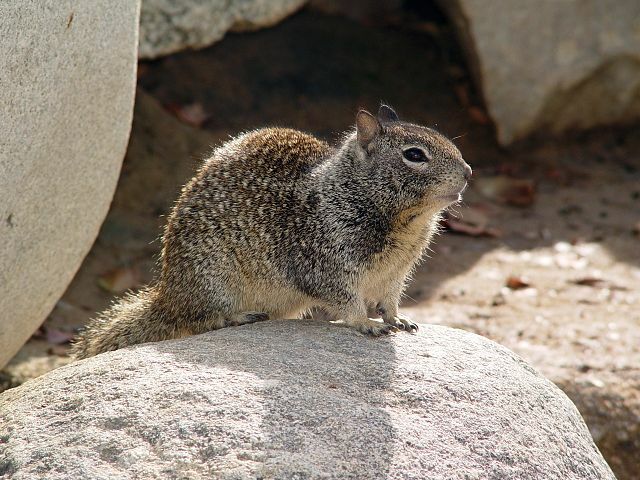 It is common to call certain ground squirrels as gophers due to their similar appearance. Normally, gophers are about 0.5 pounds in weight and have a body length of about 6 to 8 inches. They also have a tail that is about one to two inches. The males are usually larger than the females and can weigh as much as double the weight of the females. Some species can have a weight of about 1 kg or more as well. Gophers have a short life span and live for only about one to three years. Ground squirrels belong to the family Sciuridae, the squirrel family of rodents. They generally live on the ground and sometimes in the ground rather than trees unlike normal squirrels. Medium sized ground squirrels are more commonly referred to as ground squirrels because the larger ones are more known as marmots or prairie dogs and the much smaller ones are called chipmunks. Their unique characteristic is that they can remarkably rise and stand straight on their hind legs. They can stand in this manner, fully erect, for very long periods. They have short tails when compared to other similar species. Gophers prefer remaining underground as well as eating underground. They normally like to eat plant roots. In contrast to this, ground squirrels, as is suggested by their name, remain on the ground most of the times. They eat plants that produce food, ornamentals as well as insects. There is also a difference in the times that the two would prefer to be above ground. Gophers come up at night time as they are nocturnal. On the other hand, ground squirrels would rather be on the ground at day time as they are diurnal. Let us also compare the types of holes in which these creatures live or hide. Gophers live in their characteristic crescent shaped plugged holes. Ground squirrels, however, do not hide their holes nor do they plug the top. Moving on, ground squirrels are known to live in colonies that consist of several dozen animals. Gophers do not prefer living in colonies; they are solitary animals and would rather stay alone or in very small families. They can have territories of up to 2000 feet. allana. "Difference Between Gophers and Ground squirrels." DifferenceBetween.net. February 11, 2015 < http://www.differencebetween.net/science/nature/difference-between-gophers-and-ground-squirrels/ >. I have a farm and neighbors on each side if me have both gophers and ground squirrels but I don’t and haven’t for over five years. I spent many hours day and night sitting outside with my 22 and 410, when they came up I shot them and let them slide back down the hole covered and left. If you get good and watch you can actually see the grass moving as the start tunneling close to the top, then you can hold the 22 about six inches above the ground and shot down. None of the others will cross over the died or bones of others. It is a long job but very very very worth it. I can now enjoy my silver Gray’s and I don’t have to worry about the creature’s getting into wiring in the tractors and chewing them up. No chemicals just a lot of patience. On a funny note my little dog would sit beside me and when I told him I’m he would run over sniff and then pee on the hole.